Space Required: Large. Indoors or outdoors. Group Size: 8 to 15 ideally. For larger groups, you might want to consider another Hover Ball. The Move the Bomb game involves moving a ‘radioactive bomb’ around a number of obstacles. The ‘bomb’ must then be safely deposited in a designated safe area. Participants will be required to work as a team, the activity also aims to test leadership as well as communication skills. Before the activity, set up the hover ball course and remove any safety hazards from the area. Ensure that the cone (cradle) has enough rope strands for one per person (for larger groups allow them to share). Introduce the challenge to the group: The team is in a simulation in which they have to transport a radioactive bomb through a range of obstacles to a safe zone. The bomb can only be handled with the cradle provided. Give the group enough time to discuss the challenge and allocate roles. When they are ready, place the ball (bomb) on the cone (cradle) and begin the challenge. Players may only use the items or equipment given to them. None of the team members are allowed to touch the ‘bomb’. Every member of the team must successfully complete the obstacles. The team must start over again if the ‘bomb’ is accidently dropped. Each rope attached to the cradle carrying the bomb has to be held at the end. Nobody is allowed to shorten the ropes. All participants should always be aware of the obstacles, this is especially important if they are blindfolded. This activity can be done indoors, the obstacle course can be made out of chairs or anything that is available. In theory, the game is quite easy to understand, a team must move from one point to another through a number obstacles, while carrying a ball. This ball must remain stable until the team reaches the other end of the obstacle course. You can create your own obstacles, or you can simply use desks or chairs. Rope: 7m X 2 ropes, for the narrow alley as seen in the image below. Rope: 4m X 2 ropes, which is needed for the over and under fence. Put a rule in place, which only allows certain members of the team to talk. The cradle for the ‘bomb’, is the marker cone. Attached to the cone will be all of the rope strands, which each member must hold at the ends. The ball or ‘bomb’ will be placed in the cradle. The team must now use the ropes and manoeuvre around the obstacles to get to the other side of the course. 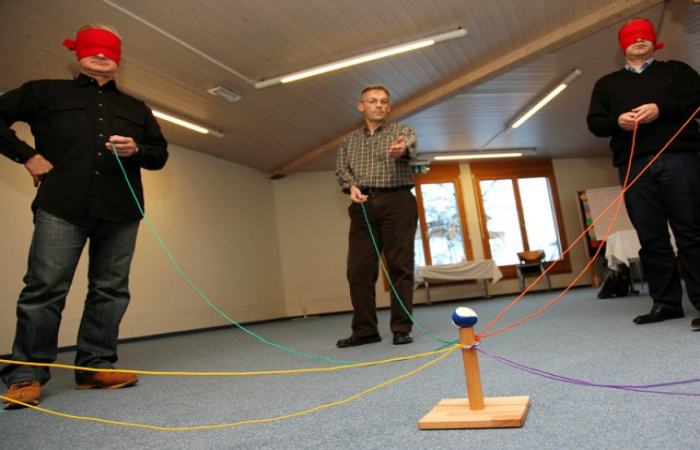 Each team member must pull on their rope to move the cradle and ball in the desired direction. If you have 12 members in a team, you will then need 12 pieces of rope. All of these ropes must be attached to the cradle. You can accomplish this by drilling a few holes into the cone. Attach the rope, which can also be string, to the cradle, make sure it is evenly spaced. The rope can also be different lengths, to make it more difficult. Tie off the rope with a simple knot. Players must then hold the ends of each rope. Did you have any problems with completing the activity? To solve these problems, what did you do? Did your team come up with a plan? Was there a point where you had to change these plans? Do you think communications played a major role during this activity? As a team, do you think your communication was good? Do you think that there is something you would do differently, if you had the chance to do it over? What did you do to show your support to others? Do you think leadership is important for this type of activity? How did you feel about your team, did you work well together? Your team is in a simulation in which you are required to transport a radioactive bomb through a series of obstacles from the start point to the safe zone, using only the cradle provided. The bomb can only be handled with the cradle provided. All team members must pass through each obstacle. If the bomb is dropped, your team must restart the challenge. The ropes on the cradle must be held at the ends, and cannot be shortened. Beware of obstacles especially if blindfolded.